Something is missing from the DC Universe. Wally West, the original Kid Flash, is on another plane of reality and desperately trying to break through to the real world. He visits Bruce Wayne in the Batcave but the connection to reality isn't strong enough and he only has time to tell Bruce that the letter from his father is where it all started. The connection is severed and Wally is once again elsewhere. He remembers his origin and the events of Flashpoint. This is the moment that someone outside of time watched and attacked. They stole ten years from the universe. Wally doesn't know how but that changed everything. He disappears back into the vortex and searches for something or someone else to bring him home. Along the way he tries to contact an old man that is babbling about a Thunderbolt and McCarthy. Other events play out across the DCU A woman being interrogated by the police. There is no trace of her in the system and her only possession is a ring with the letter L on it. Ryan Choi receives a message from Ray Palmer. Not a message. A warning. Jaime Reyes refuse Ted Kord's offer to work with him as the Blue Beetle. After Jamie leaves Dr. Fate arrives and warns Ted that he does not understand the magic he is meddling with. The woman known as Pandora is disintegrated in a flash of blue light. Wally continues his attempts to reenter the world. He watches a group of heroes investigate the site where Superman died. An older Superman from another reality receives a visit from a man calling himself Mister Oz. Oz tells Superman that not is all as it seems. Elsewhere Aquaman asks Mera to marry him. Wally tries to make contact with the new Linda Park. In the old reality they were married but this Linda doesn't recognize him. Finally Wally tries to contact Barry and with his uncle's help he is able to fully materialize from the void. Wally tells Barry that there are others out there messing with reality. Even now those people are watching them. In another reality a man named Adrian asks another man if he did the right thing and follows that by saying that it all worked in the end. The other man tells him that nothing ever ends. 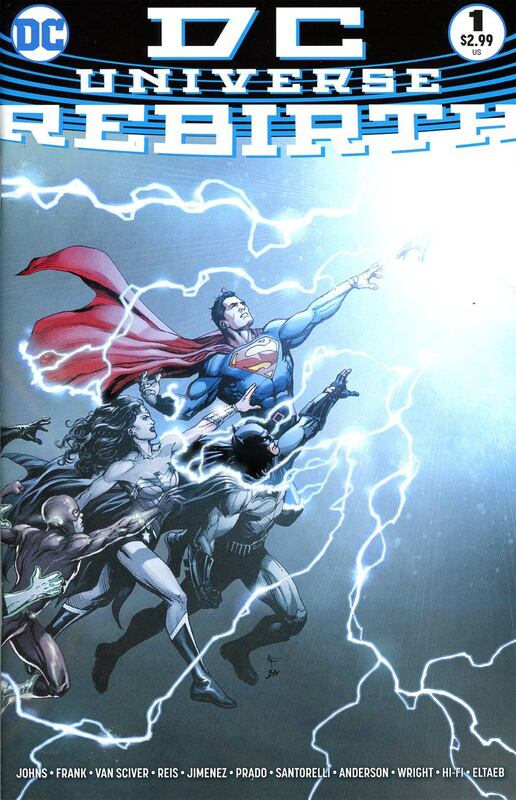 Story - 5: I was pretty close to giving up on DC Comics. That's not an exaggeration either. My favorite comic book company and my preferred comic universe seemed to be doing everything in their power to make me want to walk away. Between starting ACTION and DETECTIVE COMICS over at number one to getting rid of the Justice Society to establishing a nonsensical five year time line...it seemed like the powers that be were bound and determined to get rid of everything that made the company special. I'd go into everything wrong they did with Superman but we don't have that kind of time. It made me sad because as much as I like Marvel and as much as I have read books from other publishers DC was always my home and the New 52 did away with just about everything that made it feel that way. It's like that scene in the movie "Grosse Pointe Blank" where Martin goes to visit his old house and finds that it has been turned into a convenience store. I would stare at the new comics and recognize the structure of the universe but everything else had been changed into something...else. I tried about twenty titles when the New 52 began and four years later I was only buying the Superman titles and JUSTICE LEAGUE. Then DC UNIVERSE: REBIRTH #1 came out. This is one of those comics that you have to cover two ways; the story and what the comic itself represents. The story was great. Wally West has been one of my favorite characters for over twenty years now and while I liked what Geoff Johns had done with the return of Barry Allen I always felt that Wally had gotten the short end of the stick which is odd because one of my favorite runs of THE FLASH when Wally was the main character were written by Johns. One of the character's best writers is also the one that was key in making him redundant. This is actually what made Wally the best choice to be the character that would act as the entry point. He represents the disenfranchised fan that feels like something has been missing and is trying to bring back the key elements that made the DC Universe unique. The trip through the contemporary DCU and the introduction to the new players was very smooth. At no point did I feel like the scene transitions were jarring. It was just the opposite. I had to slow myself down so I didn't miss the smaller things. The scene with the old man in the nursing home surprised me because normally I hate the Golden Age Johnny Thunder but if his return means the return of the JSA then it's great seeing him. The sequence with the time lost Legionnaire made me smile as well but not for the obvious reason. As awesome as it was to see the Legion Flight Ring it was even cooler to see Maggie Sawyer again. I realize that she was a supporting character in BATWOMAN but it had been some time since I had seen her. The mystery that Ryan Choi opens up in the Atom sequence has that patented Geoff Johns foreshadowing where a character nearly reveals something important and then the rug gets pulled out from under the character receiving the cryptic warning. Ted Kord was in this comic fulfilling the promise of seeing him during Forever Evil. And he's built a Bug. And Jaime is the actual, factual Blue Beetle. And Dr. Fate showed up. With the turn of every page I felt more and more like I had come home. Then there was the reunion of Barry and Wally. The scene with Linda Park was heartbreaking but I'm emotionally invested in that relationship. So it was bad enough that she didn't recognize Wally but what wrecked me was Barry hugging Wally and asking how he could ever forget his nephew. That just...I can't even describe it. Again, it was the missing piece of the puzzle that I didn't realize was truly missing until it happened. So on a story level this special did everything it was supposed to do up to and including introducing a mysterious threat. All signs point to the characters from Alan Moore and Dave Gibbon's WATCHMEN series and the reaction that revelation caused was huge, especially on the social medias. Some people absolutely hate it and think those characters should be left alone. I am on the other side of that fence. As much as I respect WATCHMEN for what it represents to the form I am also a fan of character and if a writer wants to take a supposedly sacred cow off the shelf and use it while playing with the other action figures I'm good so long as the story is worth it. I enjoyed the various mini-series from BEFORE WATCHMEN that I managed read so for the moment I have absolutely no problem with this. If the payoff is botched I'll have a problem but as long as the story supports what the writers are doing with the characters then I am good. The big surprise of this special was the fact that as awesome as it is for all of these characters and concepts to return there is something going on in the background and it's not good. I wasn't expecting a mystery of that kind but now that it's here I am liking it. When Mr. Oz tells the Pre-Flashpoint that he and his wife are not what they believe they are and neither is the fallen Superman my curiosity was good and piqued. What does that even mean? More importantly what is this leading to? When I started asking those questions I knew I was done. I'm in...nearly all in on this new direction. I want to see where this goes and what everything means. Man it's good to feel like this. I haven't felt this attached and invested in the DC Universe since...wow, since INFINITE CRISIS. That was ten years ago. I know there are a lot of readers out there who have their doubts about this new initiative and to be honest I don't blame them. DC has done a lot over the past ten years to disenfranchise their readership. The fact that DC has recognized this and extended an olive branch means something. I am not sitting here trying to convince you that DC won't screw this up somehow. They have been down this road before. At the end of INFINITE CRISIS there was the promise of returning to a more hopeful universe. Most of what drove the villains of that piece was a feeling that things were darker and that they were going to set things right. So reading Wally talk about a darkness infecting the DCU feels familiar and hopefully this time it's something that sticks and not just a story point that DC will later ignore. For the moment I feel like the DCU is a universe I want to read about. A universe where I care about what happens to the heroes and even the villains. A universe that I'm invested in emotionally. A universe that makes me look forward to Wednesdays. So far signs are pointing that that is exactly what we are getting. I'm willing to take the chance. Art - 5: Gary Frank. Ivan Reis. Ethan Van Sciver. Phil Jimenez. Any one of them would have been a fantastic choice for this book but mixing all four together made the comic even better. To be fair I've been hard on the more recent Gary Frank art I've seen, especially his Superman work but I had none of those problems this time around. In fact, it's hard discussing the art because I like so much of it. The full page splash of Wally's reveal was amazing and Van Sciver was definitely the guy to go to for that considering his involvement with FLASH REBIRTH. The scene with the time lost Legionnaire was particularly good with how it didn't reveal who the woman was but built up nicely to the shot of the ring. Gary Frank's take on Dr. Fate was great. The page layout of Green Arrow and Black Canary had two great hero shots followed by two panels of the characters looking lonely with the additional touch that the side of the bed the other was supposed to be on was empty. Seeing Ollie and Dinah so happy in their hero roles and then so sad in their civilian guises was emotional enough that I felt what those characters were feeling. That was the key to the art in this special; emotion. This story was cosmic in scale and yet none of the artists forgot for a minute that the story was about how there was something missing from the DCU. I'm not exaggerating when I write that the reunion of Barry Allen and Wally West choked me up and while the dialogue in that sequence was everything it needed to be it was Phil Jimenez's art that sold the scene and elicited such a strong reaction from me. Making the audience feel what the characters were feeling was just as important to the artists working on this special as the hero shots and the reveals and as cheesy as it sounds I want to thank them for that because it has been a long time since I got this emotional over a comic book. That shot of Wally towards the end of the issue looking all desiccated? That is Phil Jimenez doing a brilliant homage to a similar scene from CRISIS ON INFINITE EARTHS #2. Even the art is paying tribute to the history of DC Comics. So thanks, guys. I really appreciate the effort you put into this special. Cover Art - 5: Sometimes a reference is so perfect it makes the cover better than it was before. The art on this particular cover was great to begin with. Gary Frank gives us a nice wraparound look at the characters of the DCU all going reaching out towards a hand. Superman's fingers and the hand's fingers nearly touch. This is a very clear homage/pastiche to one of the sections of the Sistine Chapel in the Vatican. It's probably the most famous section where God creates Adam. So on one level it's cool to have a comic book cover reference one of the greatest examples of High Renaissance Art. Thinking about it deeper the hand could very well be that of Dr. Manhattan and since the implication is that Manhattan stole ten years or maybe even had a hand in the creation of the New 52 than the cover has an even greater connection to that part of the painting. No matter the case this was a great cover. It fit the comic quite well and was a great composition. Variant Cover Art - 5: As much as I love the main cover this is my favorite. 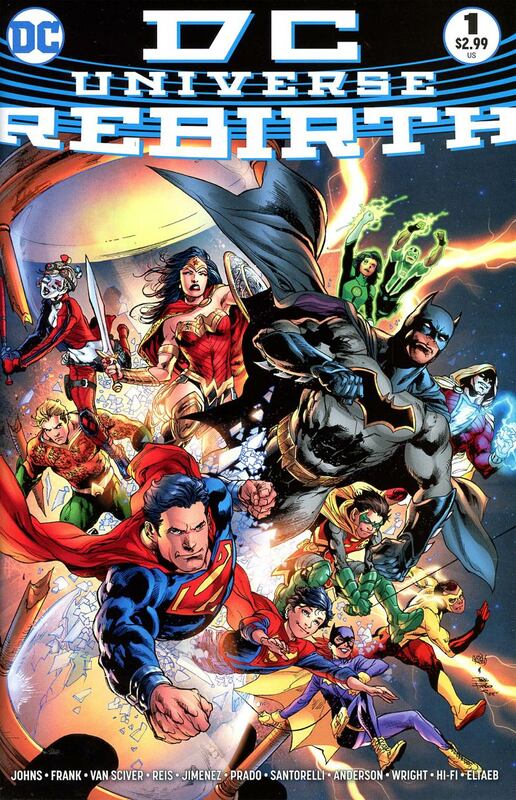 To be fair some of that has to do with the fact that the old school JSA and JLA are on the back part of the wrap around but beyond that it's just a cool image. The image of all the heroes breaking out of the hour glass with Superman, Batman and Wonder Woman in the lead sends a great message that while they are honoring the past this is the DCU they are going with at the moment. I liked this cover so much I paid the extra money for it so I could have both the main and variant cover. B&W Variant Cover Art - 4: This is one of those rare times where I don't prefer the black and white variant to the colored version. Don't get me wrong. This is a great image and the black and white version looks pretty sweet but the coloring on the other version of this just pops so much more than the black and white does. Still, if I had the extra money this one would have come home with me as well. Thankfully it was included in the digital version.